If you experience some trouble, please, first read those questions and answers. Here are some troubleshooting questions / answers regarding the experience on court. My court is not recognized by the device what should I do? Read the On court setup page and also the Troubleshooting on court page. How do I review a line call that has just been made? On the Line Call UI, press anywhere on the court to see a video review of the ball bounce. I think that In/Out has made a wrong line call. What should I do? In/Out use artificial intelligence to make line call so it needs to learn. Check with the review how the call looks. If you think it's accurate or innacurate, use the report button. It will help the device to learn and improve the calls. 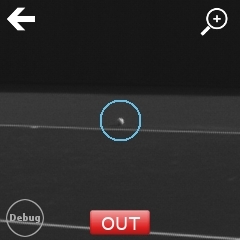 How can I improve court recognition and ball detection with difficult light conditions? The default light setting in the "Advanced" screen (bottom left corner) is automatic. The In/Out device will try to adjust to the light conditions - to be more precise, the device is adjusting independently the exposure of the cameras depending of the light environment. You can also force the light setting to normal and intense. Intense setting is when an "intense" source of light is in front of the camera. This is the case if you play with sun facing the cameras (early morning, late afternoon with camera facing the sun). It's also the case if you play outdoor at night with four or six big light poles. Here are some troubleshooting questions / answers regarding the device. How do I close the tennis ball with the device? The screen of the device remains black. What should I do? Remove the battery and charge it for a few hours. Insert the battery and make sure it clips. Press the power button ON/OFF on the right. If the screen doesn't turn on and doesn't become white, open a support ticket with the "In/Out support team". The screen of the device remains white. What should I do? Remove the battery and charge it for a few hours. Insert the battery and make sure it clips. Press the power button ON/OFF on the right. If the screen turns on and remains white, you need to reinstall the firmware with microSD card. Read this section of the "Firmware Upgrade" page. The device boots, shows the In/Out logo and then reboots forever. What should I do? Your device is not broken but it is "software bricked" so you need to reinstall the firmware, booting from a microSD card. Read this section of the "Firmware Upgrade" page. How do I reset the firmware to the factory state? Go to "Settings", then "Advanced Settings" and select "Factory Reset" in the bottom right corner. How long can I record videos? How much storage do I have and does it take? You can record videos of both half-courts and the size of the video is around 1 MB for 1 second. The internal memory has a 3.5GB storage space. You could record around 1 hour of video in the internal storage. You can also insert any microSD card. The device will then record on the external microSD card. The same rule of size applies. How do I transfer the videos out of the internal storage? Connect a PC or a Mac 5GHz Wi-Fi to the device HotSpot. 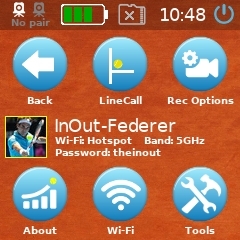 Point a browser (Chrome is recommended) to http://player.inout.tennis. Click in the left menu on "Video". How do I change the SSID name of the 5GHz Wi-Fi Hotspot? Connect a PC or a Mac 5GHz Wi-Fi to the device HotSpot. 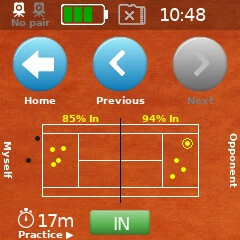 Point a browser (Chrome is recommended) to http://player.inout.tennis. Click on "In/Out" and follow the instructions there. How do I access advanced features? Go to "Settings", then "Advanced" and press 7 times on the Wi-Fi information. You will be in power user mode. Read more about what you can do with the device in this advanced mode. Here are some troubleshooting questions / answers regarding the Companion App. How do I associate the device with the Companion App? Important tip: The communication between the device and the Companion app is done over 5GHz Wi-Fi, the device being the HotSpot - the device is the "router" and you associate your phone or table to the device. You might have to jongle between your usual Internet connection and the device HotSpot on your phone or tablet. Turn on the device and note the SSID of the 5GHz Wi-Fi HotSpot of the In/Out Device. SSID name of the 5GHz Wi-Fi HotSpot of the device is derived from grand slam winners. In this case, this is Roger Federer. Associate your phone or tablet 5GHz Wi-Fi with the In/Out HotSpot. Wi-Fi password is theinout in one word, all small caps. You can download the CSV raw data of your session from the web interface. Here is how the axis are defined. The screen is too small. What can I do? Associate the device with a phone or a tablet and chose "Mirror" in the web interface or in the Companion App.